Anne Fairhall is a Victorian volunteer and carer advocate for people living with dementia. She is this week’s Changemaker. Fairhall’s husband Geoff developed younger onset frontotemporal dementia 25 years ago at the age of 51. Since then Fairhall has juggled caring for her husband while sharing her story and advocating to decision makers, promoting positive health attitudes and making life easier for fellow carers. 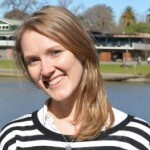 Since 2011 she has had roles on the Alzheimer’s Australia Vic Consumer Advisory Committee, the Alzheimer’s Australia National Dementia Advisory Group, the Victorian Department of Health and Human Services’ Reference Group on Quality in Public Sector Residential Aged Care and at two National Consumer Summits. In the past 18 months alone, she has spoken in a volunteer capacity at numerous meetings, budget and election briefings convened by Alzheimer’s Australia Vic with state and federal members of parliament to provide a consumer perspective in the organisation’s advocacy efforts to government. 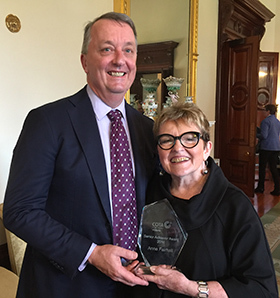 In recognition of her work she was recently awarded the Council on the Ageing (COTA) Victoria Senior Achiever Award for Significant Contributions to Local Communities and Victoria. In this week’s Changemaker, during National Carers Week, she talks about the importance of the lived experience, why people with dementia are not stupid and how out of adversity comes opportunity. How did you become an advocate for carers for people living with dementia? It was from personal experience initially. Many, many years ago my husband’s parents both had dementia, and I got quite involved with helping support them and things you do as a family. And that would have just gone as part of my life experience probably, except that my own husband, when he was quite young… developed some very unusual behaviours and it turned out that he had developed… a younger onset, frontotemporal lobe dementia…That was in 1991, when he was 51, he’s 77 now and still going 25 years down the track. I was caring for him at home for most of that time, in the early stage of that period he had functionality, he was able to do things or be left alone then gradually as things got worse, he could not be left alone, so I had to just close my business and step down from boards and committees that I was very involved with and so on. And I chose to care for him at home for as long as I could and I did that for a fairly intense way for about nine or 10 years and unfortunately, this happens to many carers, I got exhausted and I got sick myself and had to be able to recover and we had to put Geoff into residential care. That’s a bit over five years ago now. So that was sort of the journey, but then once I got well again and so on I thought, well Geoff is being cared for better now, in care, what can I do? And I actually thought, well all the things that I’ve experienced that did not work well, or did work well, the things that I had to learn for myself, everybody else is learning for themselves. So we need to do more advocacy, I felt and I had always tended to do a bit of that, I’d had senior executive roles and so on and tended to take issues up if they needed to be. So how did I get into advocacy? Well, I got into it from personal experience, first of all with family, then intimately with my husband who I loved dearly and still do, it’s just that he’s at a very different stage now, and I thought of all the things that I had learnt… I spent quite a bit of time getting support from Alzheimer’s Australia myself, but I also was very concerned about many things that didn’t work very well, and some that worked very well but it was very hard to find out about them. So I thought when I’m well again I’ll get involved. I’ve always been a fairly involved person so I got involved with Alzheimer’s, with what was then the Consumer Advisory Committee in Victoria and then I became the Victorian delegate on the National Consumer Advisory Committee… So that was sort of how I got involved broadly. My first career was a nursing career. So I trained as a nurse at Royal Melbourne, a registered nurse, and then I ran operating theatres for about 10 years. Then I decided that, this is sort of way back in the 70s, I decided that really we should be doing more in terms of prevention and I was a very early adopter of occupational health and safety. And I then went on to leading roles, so I went into corporate life and became national health and safety manager at Coles Myer for the Myer Grace Brothers part of the business and I spent another 15 or 20 years in corporate life. I climbed the ladder a bit there so I was in the senior management team eventually and then I left there and set up my own management consultant business particularly focusing on the areas of supporting CEOs and boards in meeting their responsibilities for health and safety, their legal responsibilities. And so I operated a boutique business that was very tailored for the clientele to support them, not sort of hands on out in the factory floor, although I had done that in the past, so I did that. And then boards, well I became interested 20 or more years ago in more women being involved on boards. I felt they should be and so I did a couple of courses, one called Board Step with Noel Waite and Waite Consulting and then I did the Australian Institute of Company Directors diploma course. So I was on the board of the Country Fire Authority for example, I was on the board of the Victorian Accident Rehabilitation Commission which was part of the health and safety commission, what was called VicHealth… So I had quite a number of board positions as well, and the statutory board being the Country Fire Authority, was a very interesting one, very interesting lately too of course, but it was interesting then too and I was one of only very few women who were involved at that level in those organisations at that time. So nursing, corporate life, running my own business, boards, a bit of everything, keep a bit busy, keep me off the street, just to mention a few! I’ve always done a lot and I’ve been president of Soroptimists… it’s a bit like a women’s version of Rotary, except that these days Rotary has women involved as well, but in the early days Rotary only had men and the professional and academic women used to join Soroptimist International. So I was president of that here in Victoria for a while and represented on the national council of women and various things. Too many things to probably list but I’ve been a busy involved person and I’ve been president of my professional organisations always and so I’ve been giving my time to voluntary work forever, right from early days. You have spoken in a volunteer capacity at numerous meetings, budget and election briefings convened by Alzheimer’s Australia Vic to provide a consumer perspective in the organisation’s advocacy efforts to government. Why is it important to have someone with personal experience of the issues, such as yourself, speaking out in these forums? Do you know, the stories that you can tell which are from personal experience are very, very powerful, they resonate with their listener, so whether it is a politician or an audience… As you know I’ve met with politicians and Alzheimer’s and we actually find that they just don’t forget the stories. So I tend to be happy to talk about our own story, but not just our own, I just know a lot of other people who are going through the same journey but everyone is a bit different, but some things are the same. And it’s important to have the consumers and those that have the experience because otherwise what happens is that everyone assumes they sort of know what you might be experiencing. So, many people say to you “oh I know what you must be going through”, but actually they don’t, even if they have had an experience with a family loved one like a grandparent, it’s a very different thing if you’ve had a grandparent, it’s a different thing if you’ve had a parent, and then if you have a partner, it is different again. And then from children’s point of view, they can get very confused about whether their grandpa loves them anymore and things like that, and you almost wouldn’t know those experiences unless you’ve experienced them. But I think it’s the personal stories that we find are very powerful. So at the time, when I’m presenting I keep it simple and we just think about a particular aspect of it. 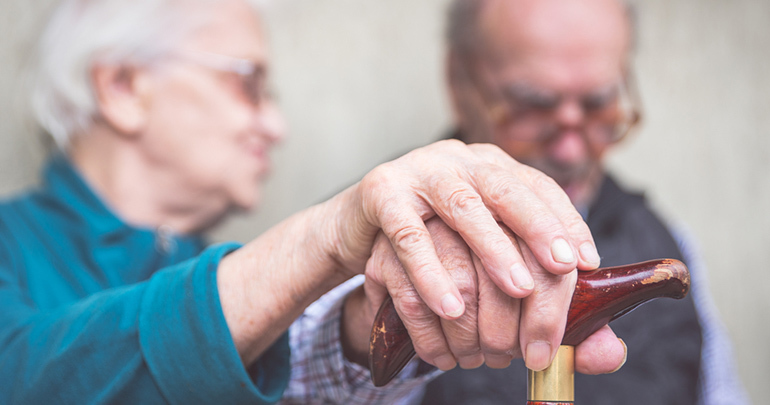 There will be many examples, sometimes we might be talking about dementia friendly communities through Alzheimer’s Australia, and encouraging that to be developed. But what does that actually mean? When I’ve addressed groups I’ve said well it can mean different things; it can mean that someone at a coffee shop is really very friendly, but it can also mean that something that the person once did, like going to the market and handling cash, they can be used or abused. This happened to us for instance, Geoff used to go up to Victoria Market, we live in the city [Melbourne], and he used to love going up to the market and I used to love him going up to the market so it would save me going up. He would go up with a wad of cash and he would come back with whatever he was bringing back, but it never really matched the money that came home. And what used to happen, not with everybody, not with all the stallholders though, but they would just use the fact that he wasn’t sharp enough to recognise whether they had given him short change back, you know, that’s abuse. But it happens. Whereas we had a lovely arrangement with nearby coffee shops, that used to know that Geoff’s little peculiarities, that his type of dementia made him very rigid, he liked to sit in the same chair every day and have the same lemon slice with his short black decaf you know, and they used to learn, they’d say “have the usual Geoff”, you know and that was really nice and there are many other examples but they’re just a couple of things. Good and bad can happen but the lived experience is quite different. Then I can give you another type of example which resonates too and that is just that theoretically it is good to have carers from agencies that can come in and support a person who is a carer, like I was, still am, but it was home care then. And yet the stresses and strains that comes with that are quite profound, they don’t necessarily give you relief, they give you someone to sit with your loved one but actually it might make them more agitated, maybe your loved one can’t understand their accent or perhaps they come in and they’ve been smoking and you don’t have a smoking house, or perhaps they come in and they don’t relate to your loved one, they just sit there but they say nothing, so there are all these different aspects which consumers who have actually got the lived experience, have experienced and can communicate to others, which can either be helpful at a policy level or perhaps in a practical sense, even organisationally or perhaps even just coaching other care staff in residential care, which I do these days too. What can be done to help people with all kinds of dementia to continue to live well in their own community? Yes, because we are trying to get them to live well in their own communities, that’s something we want, they want, we want as family members and the government wants to encourage. What can be done? Well, look I think some of the theoretical things and some of the new directions like consumer directed home care packages… very briefly what they are is they are a package of money you could say that the government makes available to people to assist them to stay in their home for longer… now that is very helpful in the early stages, it’s not quite as easy as things progress. So what can we do?… At a strategic level we can lobby government, we can actually talk to those who are developing these programs to make sure they are developing them in ways that are not just theoretical but actually meet the needs of consumers. So that’s one thing. Another is we can work with those who provide the services, so for instance I was addressing a group of local government professionals just recently, they are providers, they do a lot of liaison between their local government residences and providers of their services so they act as an in between. We were talking about what they can be aware of to make these services more useful to consumers, so you can look at different levels, they can either be government and strategic levels or they can be consumers working with… service providers. You can also work at a level where you are coaching and counselling the actual carers whether they be family carers or paid carers in the community or residential aged care, so at different levels. I often say it is like influencing the decision makers, and influencing the decision makers can be at different levels, but it can be effective at many different levels as well. Why is it important to celebrate the retained abilities of people living with dementia rather than disability? That’s very important to celebrate that. Because you see, when a person gets a diagnosis most people automatically think end-stage dementia rather than knowing that you can live very well along the way. In our case we’ve had a long journey. In the early stages there were losses for sure, but I’ve always tried to make sure that Geoff’s retained abilities are celebrated because inside the person living with dementia, they still feel normal, even if they’ve lost enormous amounts of ability. In their head, they feel normal even though we can see that they’ve lost capacity. An example, Geoff is fairly advanced now, but we have discovered that he can still play Scrabble. I don’t know whether I can play Scrabble but he can play Scrabble. It is interesting because he had learnt seven languages over the years so language and words and spelling and all those things in his part of the brain were what we call very high functioning, and so even though he has had lots of losses, like he has great difficulty turning his thoughts into words, but if he can just do it all in his brain, he can move his hands and pick the letters off a Scrabble board and he knows how to spell things. He would correct my spelling… this actually happened recently. I was writing something t-h-e-r-e and then the next bit of the sentence was t-h-e-i-r and then a little bit later I put “theyre” and he said you’ve missed the apostrophe, and it was really interesting. And yet he can’t interpret pain in his body, he can’t turn feelings into words and yet he still has some retained ability. Now, some people have different sorts of retained ability. So some people lose abilities to visualise things but they can still play the piano for instance, or many people at quite an advanced age can still sing and they can sing the words even though they can’t say the words. So the reason it’s important is that a person with dementia will say, “I’m not stupid you know”, and you have to say to them and this is true, “no you certainly aren’t”, and yet, it is very easy for people to interpret silence or wrong words or something with stupidity, it’s ignorance but people don’t know what else to think. And so we have to educate the community to understand that people live with dementia for a long time, gradually with losses certainly, but the brain, you have probably read about brain plasticity, and especially high functioning brains, they have a lot of retained abilities and in our situation Geoff is a very high functioning brain, and I’ve been able to teach him to read again. He lost the ability to read, he’s been able to learn to read, very slowly but he can read and if he reads it very, very slowly, he can understand what he’s reading. Some other people don’t, but I think it’s just a dignity thing, it is a human right to be treated with respect and to retain your abilities. If we were in the same situation, we might act a bit angrily or something in frustration too. So understanding what it is you are looking at and why the person reacts in a particular way, also comes from respecting what they can still do and what is too hard for them anymore. According to the saying “young people must respect their elders”, do you think this is happening enough in our current society? No I don’t, but some are absolutely understanding. You know I travel around the city on trams a fair bit, if I’m not walking and if I’m in a hurry, and many young people on a tram in the afternoons will actually just stand up and be respectful. But sometimes you get them where they don’t, you know they laugh at, not me, but someone who is struggling and they will laugh behind the scenes and not be respectful. But it’s probably that they just don’t understand. Maybe they’ve never had a grandparent or an older person experience. I think confident young people tend to act with respect but they all go through a stage in life where it’s very easy to be influenced by their peers… a bit like the buffaloes, you run with the buffaloes and if you don’t know you run over the edge with the buffaloes. I know our grandchildren are not like that, they have learnt not to be, but they’ve developed great respect for grandpa and love him dearly… initially our grandchildren were confused, they perhaps thought Geoff’s changed behaviours were that he didn’t love them anymore, one of our three-year-olds at the time felt that way and didn’t really understand it. But now of course he is older and he’s got understanding and he is lovely with Geoff. So enough respect, I think it is pretty patchy to be quite honest and that we have to say we’ll celebrate positives when we see it, but we also see plenty of not so, even interestingly, where Geoff is, we have nursing students coming in to do some work experience and some of them, they are doing nursing right across the board, some of them deal with the aged care dementia specific experience well and others actually don’t. They joke with each other and are almost disrespectful in themselves, so they’ve got a lot of learning to do. But I see it that they’ve probably just not had enough experience in this area and that will change, but perhaps it won’t in some cases, perhaps they shouldn’t be nursing. You know, maybe they’ll drop out in due course. But it’s pretty patchy. There are some great examples of the positive but I think we need to encourage the young. One of the things I tweeted recently was about encouraging respect for elders among our young people, because we’ve got an aging demographic and they need to learn and they will benefit and gain a lot if they can only open their minds to not being closed to the experience. You recently received the Council on the Ageing (COTA) Victoria Senior Achiever Award for Significant Contributions to Local Communities and Victoria, how does it feel to be recognised for your contribution? Do you know, it was thrilling. And it was also humbling, people say that word but what I mean by that is I actually thought well oh my goodness, it is lovely to be recognised but there are so many other people who do what I do, or perhaps not exactly what I do but you know, so many other people who are giving and putting in out there. I thought it was almost an honour but a slight embarrassment. But it was thrilling to be recognised and that was the overall thing really initially. And then it was a surprise. I really got quite a surprise. I knew I had been nominated, but I thought it would not go anywhere, I thought it would just go into the ether as we say and that I wouldn’t hear anything more so when it came, when I was notified that I had won something, they didn’t tell me what I had won until the actual day, I thought oh, that’s really nice. I’m quite thrilled about that. And then the really lovely thing is, then everyone else got carried away by it, family, friends and Alzheimer’s and all the other organisations that I’m involved with so then I thought now, how can I use that award and the opportunity that that gives me now to do more? Like, how can I do more advocacy or raise the level of awareness, information and understanding about dementia because our focus is about raising the awareness about the different types of dementia, the different stages of dementia, also, just understanding how to communicate with dementia and also making sure that we live well and respectfully and so on. And so I thought now how am I going to use this? To me it was sort of out of adversity has come opportunity, it has all the way along and this is yet another opportunity, which is philosophically how I see it. I’ve got a couple of them. I’ve got one that says, as I just said, “out of adversity comes opportunity”. But I think the better one is really, I like to concentrate on advocacy in “influencing decision makers… for all sorts of levels of decision making”. Because my background is one that has spanned across many areas over the years, I am very interested in influencing decision makers and creating an opportunity out of what might have been seen as an adverse situation. And I’m a very positive person, I actually see everything in a positive light.